These Goal Quotes are a collection of goal setting quotes, motivational inspirational quotes and famous motivational quotes offered here to encourage you, inspire you and motivate you into achieving your dreams and goals. The reason most people never reach their goals is that they dont define them, learn about them or even seriously consider them as believable or achievable. Winners can tell you where they are going, what they plan to do along the way, and who will be sharing the adventure with them. Goals are a preview of future events and experiences in your life. Crystallize your goals. Make a plan for achieving them and set yourself a deadline. Then, with supreme confidence, determination and disregard for obstacles and other peoples criticisms carry out your plan. My goal is to provide a wealth of free motivational quotes on topics including, life, dreams, goals, success, and happiness. Enjoy more Free Motivational Quotes here. There are thousands of famous motivational quotes from well known, recognizable public figures and authors unknown to choose from. We have picked some of our favorites. Enjoy more Famous Motivational Quotes here. Through the words of some of the greatest minds, motivational inspirational quotes will enrich your life, inspire you to strive for your best and encourage others to do the same. Enjoy more Motivational Inspirational Quotes here. I hope you enjoyed the above quotes. If you have a favorite quote you would like to share, please contact me and in the comments post the quote and who quoted it. 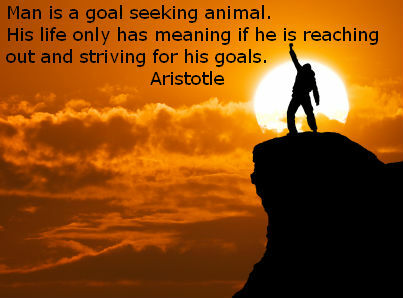 I am always looking at adding to my goal quotes and providing free motivational quotes to all. Make sure to share this page with others and keep checking back on a regular basis as I intend to add more quotes soon.